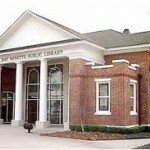 The picture is of the “new” public library. The “old” one is across the street in front of a church. It is a much smaller building. I have lived in Bay Minette for my whole life. The old library was a place where a young book worm such as i would usually hang out, but the mood and feeling would of the place make me highly uncomfortable. I have never seen a figure or a face in the window but i saw a book slide off a shelf one time unexplainably. Although the book was half off half on the shelf, there was no movement what so ever to make it fall off.